So, we’ve talked before about identifying toxic relationships and people who suffer from narcissistic personality disorder (NPD). Today, we’re gong to discuss WHY people become narcissists. According to the Diagnostic and Statistical Manual of Mental Disorders (DSM-5), published by the American Psychiatric Association, the official list of symptoms is as follows. Today, let’s dive a little deeper and discuss symptoms and risk factors of NPD. 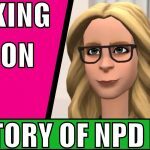 How do you know it’s NPD? 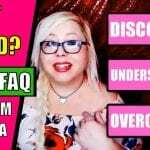 As you can guess from the official list of symptoms above, diagnosis of NPD would typically made when five or more of the characteristics are identified – but generally, the condition goes undiagnosed because narcissists see nothing wrong with their behavior. 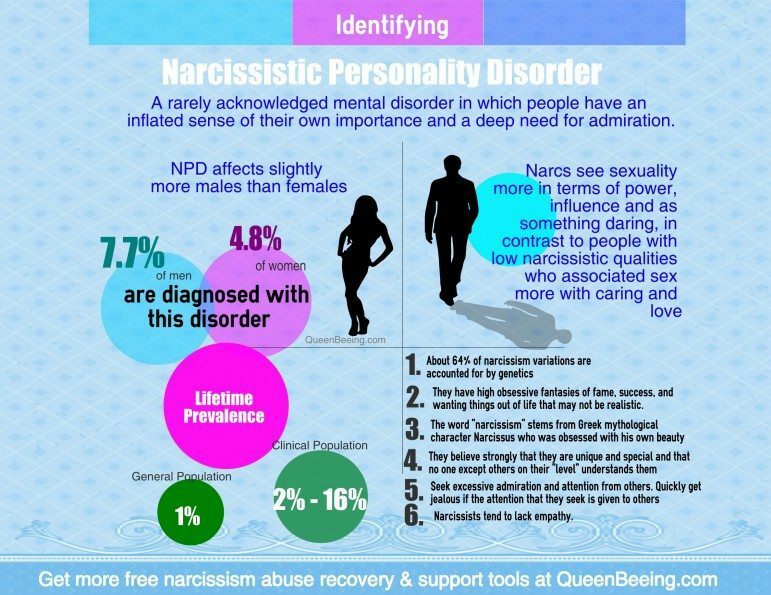 NPD goes undiagnosed because narcissists see nothing wrong with their behavior. 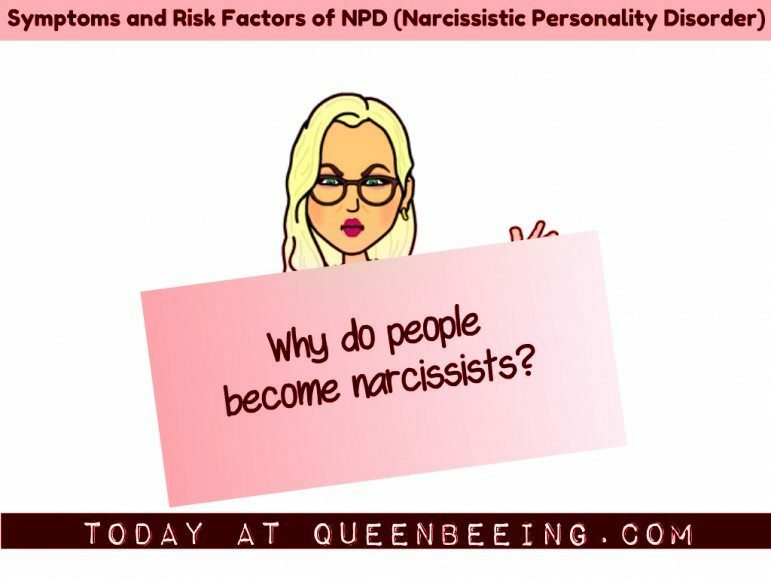 People who are involved with narcissists and those who have NPD typically report the following kinds of behaviors and characteristics – do we see a pattern? The belief that he or she is “special” and the desire to only associate with people he or she perceives are on their wavelength or who will “appreciate” them. The need for excessive admiration from those around him or her. Expectation of especially favorable treatment and automatic agreement by people around him or her. Exploitation of others around them for their own benefit or advancement. Inability to empathize with others. Feels envious of others, but also feels that others are envious of him or her. Acts arrogant, and may try to disguise arrogance with ethics. Displays an exaggerated sense of self-importance and is typically extremely judgmental. 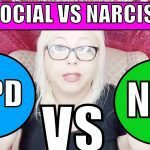 People with NPD are good at making those around them, especially people who don’t know them intimately, believe that they are something special. Family members of people dealing with NPD will typically find themselves trying to please him or her, and feeling guilty if they fail. They may even be afraid of how the person with NPD will react if their desires can’t be met or if they are defied in some way. According to some researchers, NPD may be developed when a parent fails to act empathetically toward the sufferer during his or her infancy. This is common among those born to very young parents or those born to mothers who suffer from postpartum depression or psychosis. Kids who don’t feel safe during childhood or who suffered from a lack of affection and parental praise may also develop NPD, as can those who were neglected and emotionally abused. Those who live in unpredictable situations and who feel they cannot rely on their parents are also at risk, as are those who are learn manipulative behavior from their parents. When this happens, the child gets sort of emotionally “stuck” at an early stage of development and while they may later understand logically that others exist and have real feelings and needs, they may not ever fully embrace it emotionally. While a “normal” child will usually develop feelings of empathy for others around them by the time they hit kindergarten, those suffering from NPD never do–leaving them to become adults with the empathic capacity of an infant. Do you know someone with narcissistic personality disorder? Tell me in the comments. PTSD: The Not-so-Typical Reasons many of us Have this Disorder. The narc. in my life is very sneaky able to convince some maybe even many that she is great. Some believe it at first and some even for extened periods of time. Not sure why some take to her for years one that has been her fan for years is an employee acquaintance and others in her life are sporadic or leave or she leaves them. She is haughty and loud, brash, self absorbed and wouldn’t know her own heart or soul to save her life. She feigns emotion, empathy, humor, concern only cries to manipulate. It is always her, I, me, mine. She never refers to her husband as us or we. He is her puppet and she pulls his strings and makes him dance. He has no clue. She uses her family to be a reflection on her not important or special in their own rite. If something bad happens she denies it in order to not have to deal with reality. She makes a full time job of denying all things that would over tax her brain and emotions you see. Every effort she makes is a monumental task and an APB must be put out to alert all she shoveled the driveway or did laundry or does a good deed. When someone else does it it is a chore and they should just do it. No seemingly good deed goes without mention. She often says the right thing but the emotion and affect behind it is not there. She must be pursued rarely will she reach out unless to conjole, impress, gain from it. She is never vulnerable or soft just all capable and knowing. She flashes money to those she wishes to dazzle and is passive aggressive. She is routine to a fault and complains her life is mundane but does nothing to change it. She can be flirty and sees herself as more physically attractive then she is. She has a sense of entitlement that is obvious and has had bouts of anger when not acknowledged properly. She does not often show gratitude unless it makes and impression. When her money is to be spent on a big ticket item she will treat the sales people like garbage to get her way. She sees herself as more successful, accomplished then she is and lives in a fantasy world of her making. This is very telling – thank you so much, Anon. 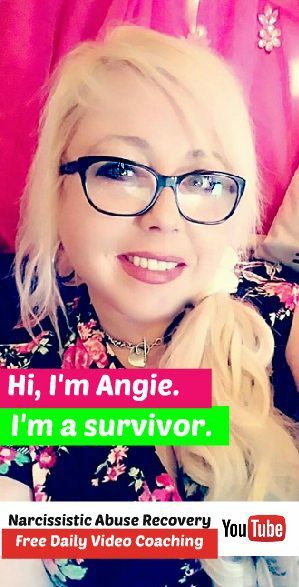 Hello Angela. Thank you for this article. I would love your feedback on a short post I wrote about three days ago. If you get a chance it is called Simply Thinking. That’s what I was doing when the content came to me. I think I said some of the same things you explain here. I just stated them differently.